Woot, woot - it's Giveaway Day 4 in our week of New Zealand Handmade Member Giveaways. And OK, a bit sneaky ... 4 items to be won again today... now don't get used to it, this is the last quadruple! A beautifully sewn fabric covered notebook cover complete with notepad. Perfect for popping in your handbag or keeping close on your desk. Say goodbye to plastic food wrap and do you bit for the environment with a Ginger Pye reusable wrap. Made from cotton or cotton blend fabric, with a strong waterproof lining and velcro tabs for secure fastening, Ginger Pye wraps can simply be wiped. Perfect for sandwiches and other lunch box goodies. The Ginger Pye giveaway is for 1 x Large Reusable Wrap in your choice of fabric from their huge range. 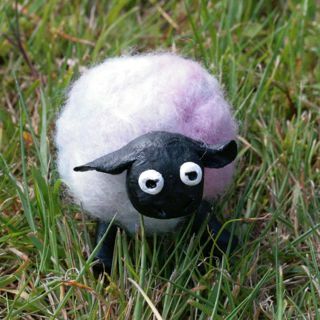 Handmade in New Zealand, my body is needle felted from local wool (soft pastel blue, pink and white) and my face and legs are sculpted from paper clay and painted. I'm best as a sheepish companion for people old enough not to rip off my limbs or head. ﻿A pair of classic pearl earrings with a contemporary twist from Tessa by Design, handcrafted jewellery and accessories. Today's 4 giveaways are open world-wide - tell your friends, family, neighbours! Winners will be selected at 10am NZ time Thursday, 21 April via Random.org and will be notified via email. I follow and I like the wonky sheep. really love the large sandwich wrap :) great way to help the environment too! I love the wonky woolly sheep, I actually included it in one of my etsy treasuries the other day :) I think its just adorable!!! Wow, these are all such great prizes, I'd love to win any of them! I would like to win a sandwich wrap please! I'd like a sandwich wrap, please! Oh I'd love the wonky woolly sheep for my oldest girl!! I would love to enter for a Ginger Pye – Large Reusable Sandwich Wrap! They are so awesome ( I have purchased from them in the past)! I follow FrugalKiwi's blog and now like New Zealand Handmade on FB. I'd love to win her Wonky Wooly Sheep (Option C). Would love to win the earrings or the wobbly sheep or the note book! I'd love to be entered on both Kazzalblue - fabric covered notebook & Ginger Pye - large re-usable sandwich wrap. I would love a Ginger-Pye wrap, they're fab! I would love to win giveaway C or D.
FB liker and Follower here. Please put me down for each of the draw because they are all beautiful. i'd love to win the Large Reusable Sandwich Wrap! I am a fan of Tessa by design on FB. lovely page. i am a fan of Kazzalblue. i am a fan of frugal Kiwi. Please enter me for a sandwich wrap - thanks! I'm a follower of all of the pages on Facebook! :-) I will be forwarding the link on my page! 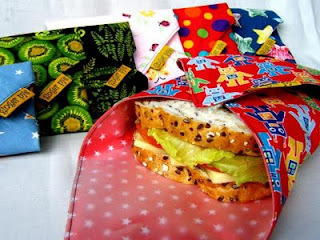 I'd love to win the Ginger Pye Large Reusable Sandwich Wrap as I am teaching my son to 'Reduce, reuse, recycle'! 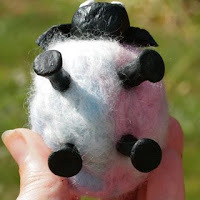 I would also love to win the Felted Kiwi Wonky Woolly Sheep for my son's room - he loves Shaun The Sheep and Timmy Time and this sheep is just as cute if not cuter than them!! The Pearl and Crystal Drop Earrings would make a nice present for my Mum for Mother's Day!! And how could I not want a delightful piece of stationery!? Please put me in the draw to win the Fabric Covered Notebook by Kazzalblue! Please enter me for the sandwich wrap & the woolly sheep. Thank you! follower of new zealand handmade - really neat stuff! link posted on my page - thanks! I love all the items but adore the sheep. the wrapper is a great green idea. Hello, can I be in the running for the Fabric Covered Notebook - fabulous and I love the sheep too. I'd love to win the earrings. I'm a follower on FB of Tessa by Design. The earring are just beautiful! shared a link to your page.